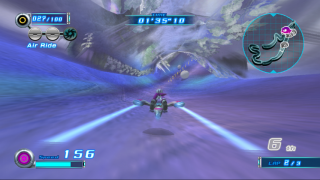 Snowy Kingdom is the third level in the Babylon story of Sonic Riders: Zero Gravity. Like Team Sonic's Botanical Kingdom, it is set inside the great domed ecospheres of Monopole, but here someone's turned the temperature way down. The giant, twisting vines remain, but they're covered by a thick dusting of snow. Jump tricks off piled-up snowdrifts, and dodge giant snowballs on your Extreme Gear! Sonic has shown up, looking for the Ark of the Cosmos as well. The fates of both Sonic and Jet are intertwined by that mysterious stone. Storm apparently failed his assignment in Nightside Rush, but Jet is on the case to secure the SCR-GP's Ark of the Cosmos personally. Tracking a squad of the MeteorTech robots outside Botanical Kingdom, he attacks the droids in the air and sends the one with the Ark crashing through the greenhouse roof. Unluckily for Jet, everyone seems to be taking cover inside the controlled eco-domes. Amy Rose picks up the smashed 'bot's Ark, and meets up with Sonic, Tails, and Knuckles. Jet overhears their conversation, and seems about to explode in rage at Amy's 'stealing' of the mereorite before Wave and Storm catch up to calm him down. Wave suggests that they instead scout ahead to see what Team Sonic are going to do, so the level sees her doing just that - and avoiding SCR-GPs along the way. This page was last edited on 8 April 2018, at 08:46.